I took this wedding picture many years ago and it is still one of my favorite images; and many of my wedding clients tell me it is one of their favorites, too. I’d like to think it is timeless. The venue where this image was created is long gone, but the picture remains beautiful and elegant. That, after all, is what great wedding photography is all about. In my thirty years as a wedding photographer I have witnessed countless trends come and go in the style of wedding photography, the albums in which your finished images are bound and in the techniques used to "edit" your precious memories. What is "cool" today is probably going to be a laughable embarrassment to you when you take out your wedding album to share with family and friends ten years from now. 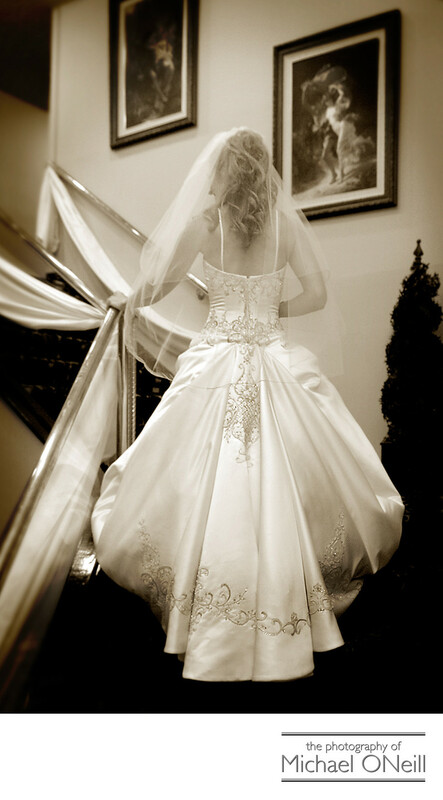 Fine retouching and enhancement of your wedding photographs can’t be done with a click of the mouse. Even your Mom can create a "vintage" picture on Instagram. Fine photo enhancement is accomplished by the photographers who will sit in the "digital darkroom" (The Computer Screen), analyze various components of the image and make the appropriate enhancements to those components. There is no global "one click" edit to create beautiful, timeless wedding photographs. I’d love to talk more about this and show you some awesome examples. If you are planning a wedding, and you want your photography to be the best that it can be, give me a call. I’d love to educate you further on what to look for, expect and demand from the photographer you entrust with the most important day of your life.